Marshall's downtown has yet another reminder for locals and tourists to just slow down to an easier, more relaxed pace, and take in the artistic and architectural sights. The Marshall Convention and Visitors Bureau celebrated the placing of the city's wallscape Friday afternoon on the north wall of the Business Development Center. 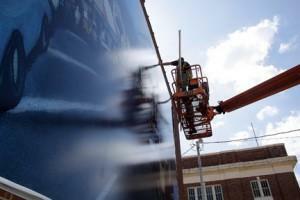 "The is the first of many wallscape projects," said Brand Manager John Arend. "The CVB is happy to see this project underway. With the Madi wall, this is the second in a series of artistic additions with many more on the drawing board." Some drivers made extra passes around the courthouse's circle-drive. Some slowed down to take in more of the artwork, an enlarged vinyl print of a painting by Marshall's own Dennis O'Bryant. "We offer special thanks to Dennis O'Bryant for his outstanding work, for his generosity and for working with the CVB on this project," said Arend. "We look forward to working with Dennis and many other visual artists in the future." Justin Bates and Mark Jones, employees of Fairway Outdoors, Dallas, placed the wallscape. Fairway generally places billboards and outdoor advertising. The wallscape is affixed to the Business Development Center, owned by the city, and depicts a downtown street scene. It includes a crowd of people enjoying the atmosphere of the street with special focus on a man in the foreground. "Frank Johnson helped with this, and we gained commission approval for this display," said Arend. The CVB approved bids for the downtown wallscape during its meeting April 9, when it was announced that O'Bryant's artwork had been selected. We agree with the Convention and Visitors Bureau that the mural now adorning the wall of the Business Development Center is, well, a work of art. This is fitting since it was created by local artist Dennis O�Bryant. Good job and it compliments the Madi Art wall just to the east and north on Washington. As was suggested, Marshall ought to be on the lookout for good spaces and quality art to place there. Doing so just adds to the flavor of our community. We would guess that the new mural is one of the things visitors will talk about when they come this holiday season. Building a remarkable place is not done overnight or with one big project, but little by little, one step at a time. We like the steps that Marshall is taking in this regard. They are certainly going in the right direction.